Add a unique look to your '06-Current Mitsubishi Eclipse! 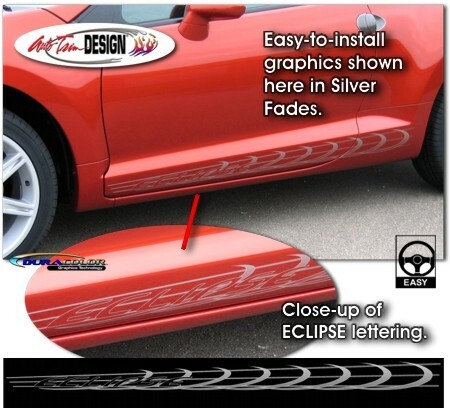 These awesome body side graphics are designed to fit perfectly on your Eclipse's lower door & body panels as shown. Starting as a dark fade at the front, the graphics gradually lighten to the rear as shown. Available in four (4) Fade colors (Silver Fades shown), Eclipse badging is uniquely set into graphic as shown. Very easy to install (light trimming required at each rear door jamb). and will fit any '06-Current Mitsubishi Eclipse. Comments: I have these on my 06'' Eclipse and they are outstanding. Still look great after 80,000 miles of wear and tear on my everyday commuter. This graphic also makes the car look unique and flows perfectly with the body lines. Nice design excellent quality. I highly recommend.